The physical change from one state of matter to another is called a change of state. The state of a substance depends on the amount of thermal energy it possesses. The more thermal energy a substance has, the faster its particles move. Matter will change from one state to another if thermal energy is absorbed or released. The change of state from a solid to a liquid is called melting. Melting occurs when a solid absorbs thermal energy. The temperature at which a solid changes to a liquid is called the melting point. 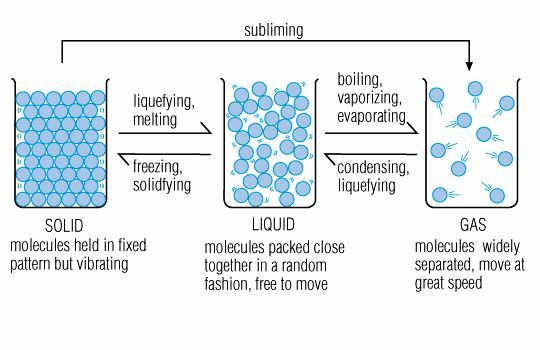 The change of state from a liquid to a solid is called freezing. Freezing occurs when a substance loses thermal energy. The temperature at which a substance changes from a liquid to a solid is called its freezing point. For a given substance, the freezing point and the melting point are the same. The only difference between the two is whether the substance is gaining or releasing thermal energy. The process by which matter changes from the liquid to the gas state is called vaporization. During this process, particles in a liquid absorb thermal energy. 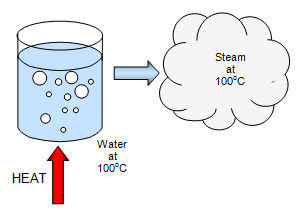 If vaporization takes place at the surface of a liquid, it is called evaporation. At higher temperatures, vaporization can occur below the surface of a liquid as well. This process is called boiling. A change from the gas state to the liquid state is called condensation. As the thermal energy of a substance increases, its particles spread out and the substance expands. The expanding of matter when it is heated is known as thermal expansion.